SOUTHFIELD, MICH., April 11, 2019 (MEDIAWIRE) – As National Distracted Driving Awareness Month begins, the Vision Zero Automotive Network (VZAN) today announced its 2019 / 2020 initiatives toward zero traffic-related deaths by 2045. In addition, the network has unveiled a newly repurposed website at VisionZero.US to serve as the online hub for the non-profit organization. Bernie Sapienza, recently appointed executive director, made the announcement after the network’s eight executive and advisory board members approved the six areas that would be the focus over the next two years. In existence since 2017, the Vision Zero Automotive Network serves to implement the worldwide Vision Zero philosophy among automotive aftermarket manufacturers, suppliers, retailers and technicians. These entities are direct consumer touch points for enhancing their existing vehicles to become safer on the road. The initiatives will be implemented by raising funds through donations, grants and paid partnerships, made possible through the network’s strong ties to the automotive aftermarket community, including the companies and brands that are represented on the network’s board. 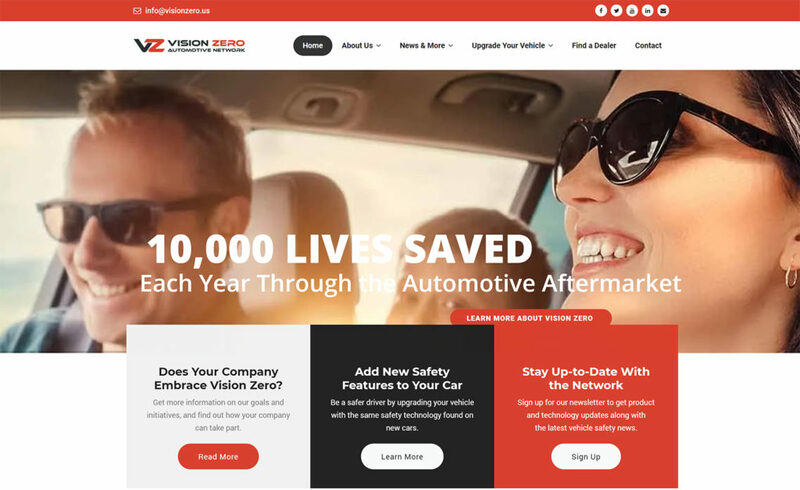 The newly designed website, VisionZero.US, speaks to suppliers, retailers and consumers that embrace the urgency of preventing driving-related fatalities by adding life-saving technology to vehicles already on the road. It describes the larger Vision Zero philosophy and the specific implementation by the Vision Zero Automotive Network. It also identifies and explains key safety product categories and the direct benefit of enhancing a vehicle with products from each. As the website is enhanced, it will include a directory of approved retail and installation facilities where customers can learn about available safety products and have them professionally installed on their vehicles. In addition, visitors can sign up to receive a newsletter to stay informed on news within the Vision Zero community as well as new safety-enhancing products and technologies. The Vision Zero Automotive Network will also create and distribute beneficial audio and video content through the website, its newsletter and social media channels. For more information on the Visio Zero Automotive network, please contact Bernie Sapienza, executive director, at bsapienza@visionzero.us, or visit the website at www.visionzero.us. About the Vision Zero Automotive Network “Vision Zero Automotive Network” is a 501(c)(3) non-profit entity dedicated to educating and encouraging the saving of lives through the addition of life-saving technologies. Our mission, simply stated, is to save lives. Using several Advanced Driver Assistance Systems (ADAS) and technologies developed for the automotive aftermarket, we have the power to make an impact now. We want to use that power to every driver’s advantage. Not in ten years. Not next year. Not next week. Not tomorrow. Today, right this minute, the aftermarket consumer electronics industry have the products and the technology that can help drivers avoid deadly accidents. Our mission is to get those products into cars and trucks that already exist, now. And once we do, we can help avoid 10,000 deaths on U.S. roads.